Aortic dissection is also called thoracic dissection. It's an uncommon condition where the wall of your aorta (the main artery carrying blood out of your heart) tears. Blood then flows between the layers causing the layers to separate (dissect). This reduces the blood flow and oxygen supply to your body's organs (such as your brain, kidneys and heart). Aortic dissection can also cause your aorta to burst, which can cause death. 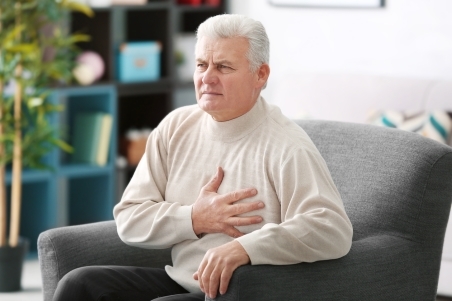 The symptoms of aortic dissection are usually sudden and you can mistake them for a heart attack. You might feel a sudden severe chest pain and possibly a sharp, stabbing or tearing sensation. Some people have back pain. You might also feel sick, vomit or feel light-headed. If you think you or someone near you is suffering from an aortic dissection, phone 111 for an ambulance immediately. We don't know the exact cause of aortic dissection, but it mainly affects men in their 60s and 70s. Having atherosclerosis or high blood pressure can increase the risk. For women, being pregnant can also increase the risk. Heart surgery or a blunt injury to the chest such as the steering wheel hitting your chest in a car accident are other possible causes. How is aortic dissection diagnosed? If your doctor suspects an aortic dissection they'll send you to hospital. You may have a heart tracing (ECG) and a blood test to rule out a heart attack. They may arrange tests like an X-ray, a CT angiogram (CTA) and an echocardiogram. For information about these tests, see Tests for blood vessel problems. How is aortic dissection treated? You need to have treatment straight away as an aortic dissection is life threatening. You're likely to be given medication to lower your blood pressure. traditional surgery, where the surgeon makes a cut through your chest or stomach to allow access to your arteries. For more information about these types of surgery, see Treatments for blood vessel problems. This page has information about types of complications that can happen with aneurysms, including dissection. Written by HealthInfo clinical advisers. Page created July 2018. MedlinePlus – Aortic dissection, retrieved December 2016.